Friday night Rich and I were exhausted so he came over and we made some delicious potatoes and sausage. We are trying to save money by not eating in restaurants until New Year's. He pointed out that for less than the cost of going out to dinner got a few meals out of this. 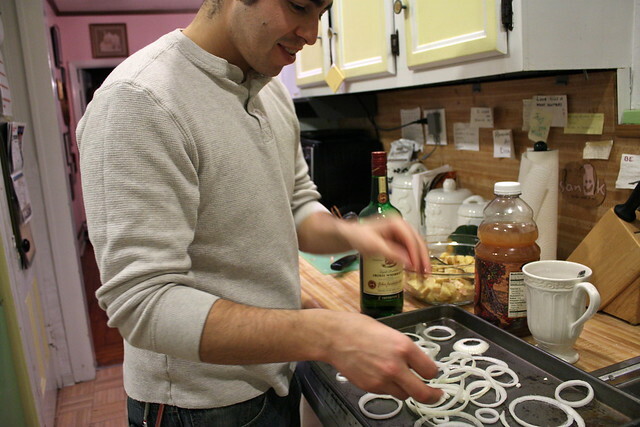 Rich sliced onions because I'm a big baby, and he scattered them around on the tray. Diced potatoes with herbs, salt, pepper and olive oil on top. 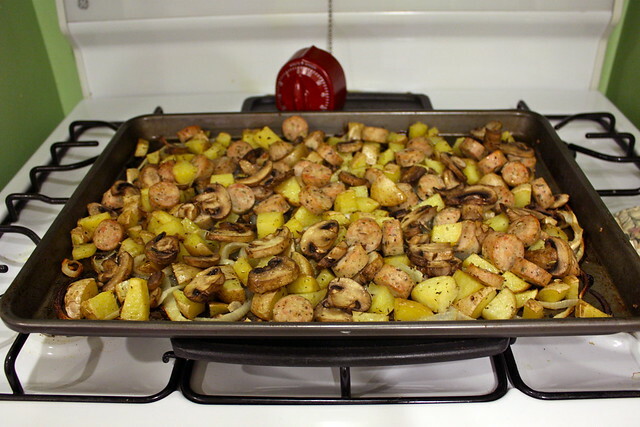 While the potatoes and onions started were roasting I sliced chicken sausage and stirred in herbs and olive oil. 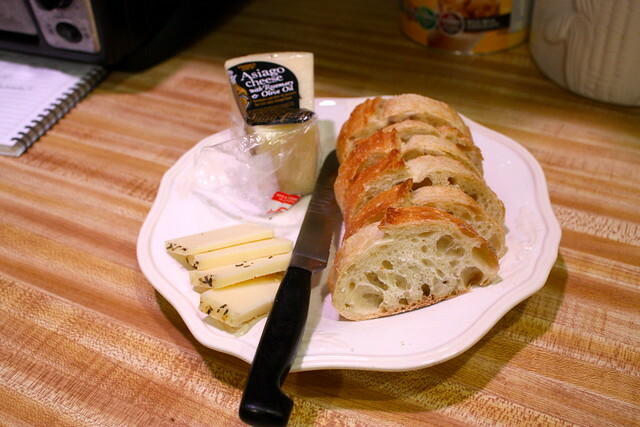 I grated cheese (fancy schmancy Asiago with rosemary and olive oil from Trader Joe's) and saved some to eat with baguette. 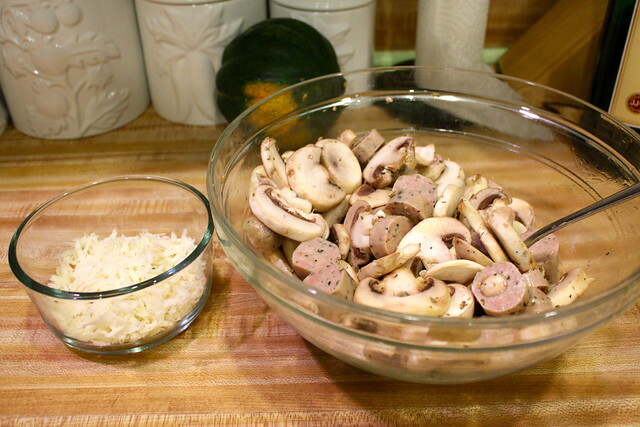 After the potatoes cooked for 20 minutes I added the mushrooms and sausage for another 20. We hung around drinking warm cider with Jameson whiskey and munching on cheese. Yum, especially with the grated cheese on top! We ate dinner and cuddled on the couch watching Crazy, Stupid Love and The Prestige until late at night. So super relaxing and cozy. Sometimes quiet Friday nights are a million times better than going out. Looks simple, easy and yummy! This sounds like a wonderful night in! I always enjoy a good night at home. 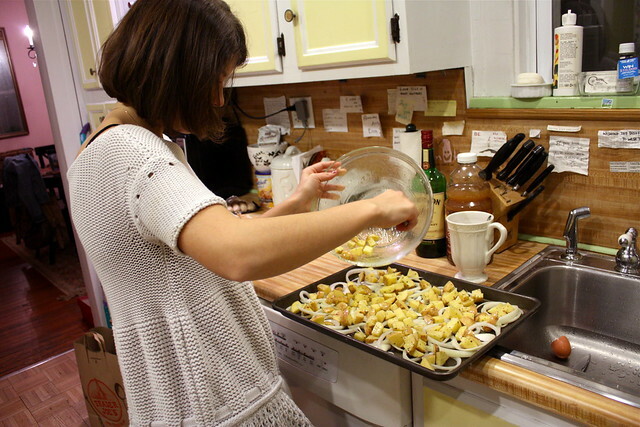 this sounds like a lovely way to spend and evening...i've actually never roasted potatoes...did you bake or broil? This sounds like a perfect night! Sounded like a fabulous night in, and that looks delicious! 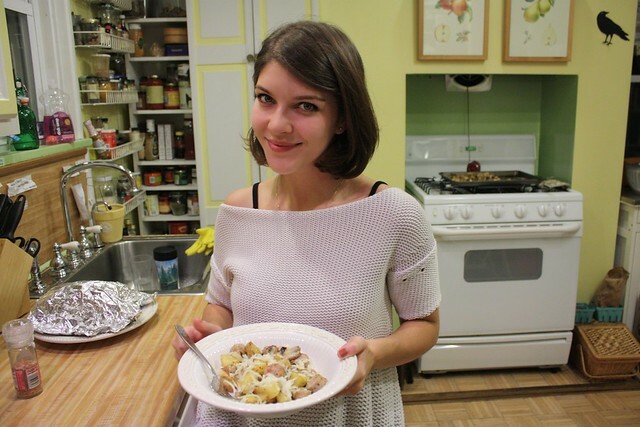 looks so very yummy and i love your knit dress! Aw this looks like a perfect night in. Home made food really is the best sometimes. You look so pretty in that last photo! Yumm. I love quiet nights at home with a good movie. "Crazy, Stupid Love" was a great choice. that looks delicious. I wish Kevin and I could cook together but I am kind of a beast in the kitchen. Minus the meat, this sounds tasy! Yum so delicious! I am so making this on the weekend!! !